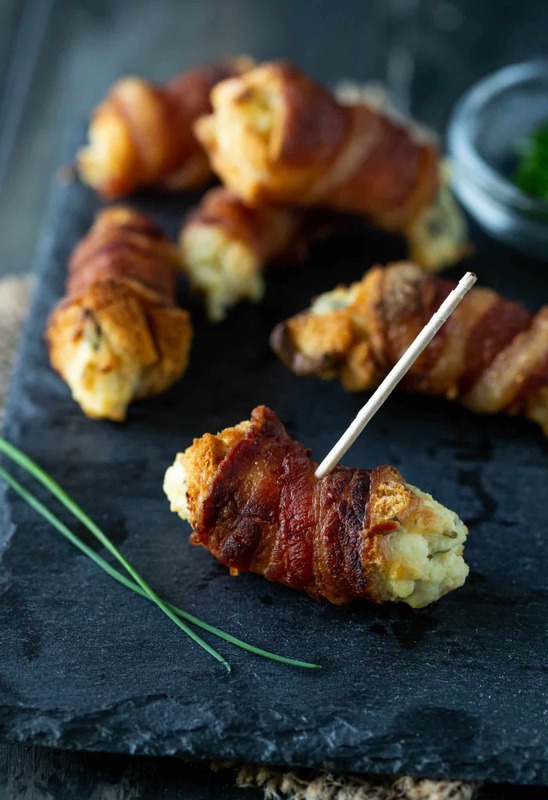 Gooey and crunchy, these Bacon Cream Cheese Bites will steal the show at any party. Guaranteed. People always go crazy for bacon, right? I have the perfect party food for you today that is just 4 ingredients, family friendly and incredibly easy. These Bacon Cream Cheese Bites are in no way, shape or form healthy, but they are a simple indulgence, and I know you will be thanking me for them later. 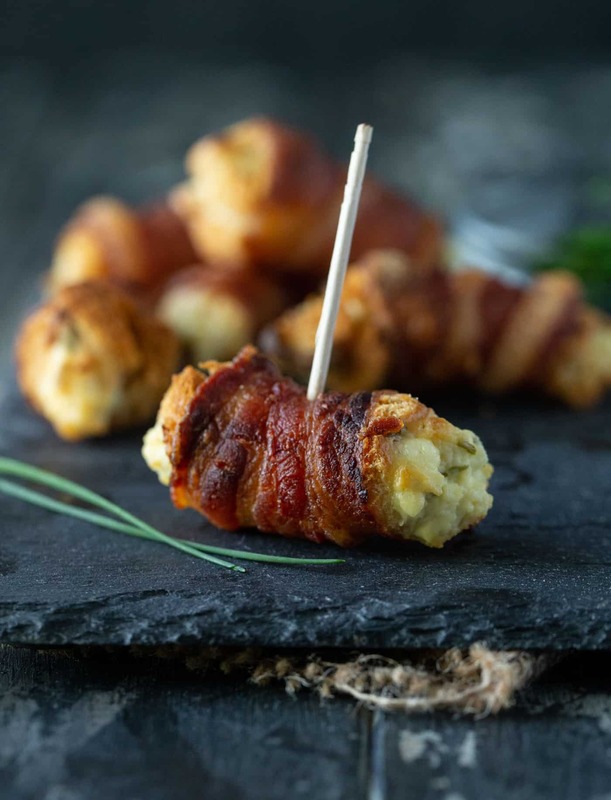 Now be prepared; these Bacon Cream Cheese Bites filled with cheesy, crunchy goodness are literally show stoppers. 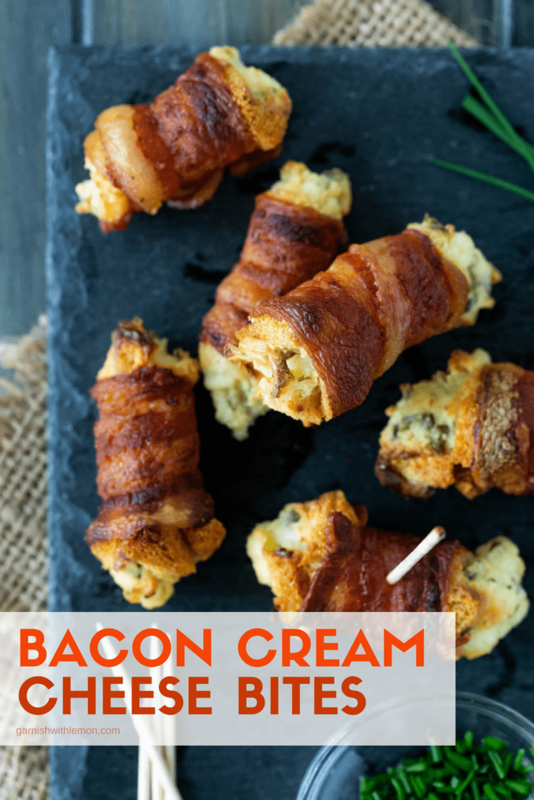 What ingredients do you need to make this Bacon Cream Cheese Bites recipe? You can’t go wrong when there are only a handful of ingredients. Does it get much easier than this? How do you make Bacon Cream Cheese appetizers? It’s simple to make these little bites of goodness. First, cut the crusts off the all of the bread and reserve those for another use. Spread some of the cream cheese on each slice of bread and sprinkle with chives. Using the long side of the bread, roll into a log form and spiral wrap the bacon around it. Cut in half and bake until crisp. 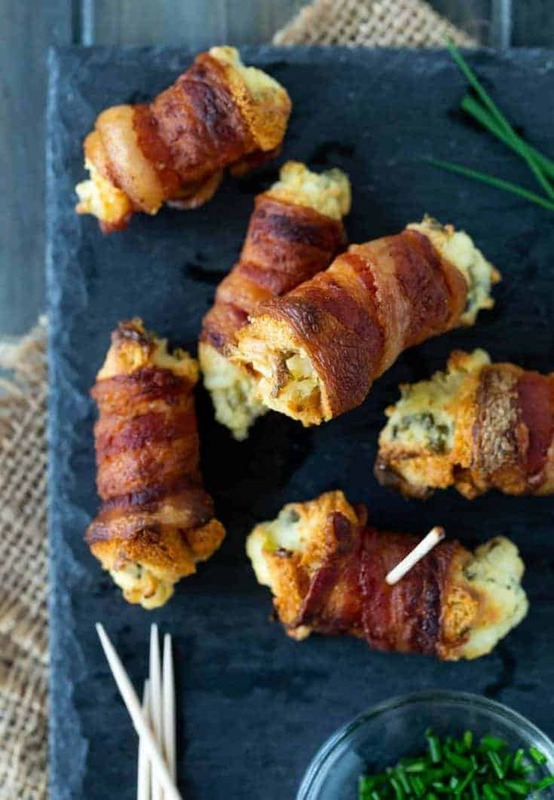 Can you make these bacon appetizers ahead of time? Absolutely! Prep these the morning of the party, place in a plastic container and cover tightly. Refrigerate until ready to bake. These Bacon Cream Cheese bites, my friends, are what you call good party food. And good party food that is easy to make and always disappear pretty much ticks every box on my list of easy appetizers. What can I say? My job here is done. Are you following us on Pinterest? We have a bunch of party-ready foods waiting for you! Everyone loves bacon. Here are some more bacon appetizer recipes to try at your next party! Check out just how easy this Bacon Cream Cheese Bites recipe is with our new video! Bacon cream cheese bites are a crowd favorite at every party. Preheat oven to 400 degrees. Line a baking sheet with aluminum foil. Set aside. Sprinkle 1/2 teaspoon of chives on top of cream cheese. Starting at one end, roll each slice of bread into a tight cylinder. Wrap a slice of bacon around each cylinder, spiraling to cover the whole piece of bread. Bacon and cream cheese? Oh my goodness these look sinful and wonderful!! You hit the nail on the head, Liz! They are soooo good! Enjoy! WOW! When I seen these I had to check them out. They look almost exactly like the Jalapeno peppers that my son makes. Soooooooooooo good. Would love to try this. PS We cut the peppers in half, clean out the seeds then fill with cream cheese and wrap a full piece of bacon around them and cook until done. Cooked about the same way as this! We have these every Christmas Eve. These look so delicious, I have to try them! The look very similar to what my grandmother made for Christmas lunch every year when we were young. And she had to make tons of them. I like the variation of cream cheese, grandma use cheese slices. We have a snack bracket party each year for Super Bowl. I have been looking for the winning dish. Sounds like I found it! Thanks, Lisa! Will try these foe Bunco night. I have done this with cream of mushroom soup. Everyone loved them. Talk about picture perfect football food!! LOVE these! My family makes these all the time but instead of chives, we use green olives, chopped and mixed into the cream cheese. Yummy! Can these be assembled the night before and baked in the morning? Hi Marilyn, Yes-they can be made the night before. Just be sure you cover them tightly so they don’t dry out! Yes! Just make sure to cover tightly so the bread doesn’t dry out! Enjoy! A M A Z I N G ! ! ! ! Nothing more needs to be said. I have also made these for years but a little bit different. I used Pimento cheese spread instead of cream cheese. I take 1 slice of bread spread the Pimento cheese on and cut the slice of bread in half. Then I wrap this with a half a slice of bread with a half of slice of bacon. Put a toothpick through it put them on a cookie sheet and bake at 350 degrees for approximently 25 to 30 min. then put them in a crock pot to keep them warm. Has anyone ever but these in freezer? I have but wondered how long they would keep in there? Ooh, I love the pimento cheese inside! I have never tried to freeze them, so I can’t speak to how that would work. If you try it, please let me know! Wow – how decadent! Definitely a “sometimes” food, as I teach the kids. It’s no wonder your friends like when you bring snacks to the party! Delish!!!! I’d love to have these on Sunday for Superbowl!! Love the bacon cream cheese combo! These won’t last long in our house! Totally just added these to my food list for Sunday! These are fabulous!!! the perfect game day food! Do you roll the bread top to bottom (lengthwise) or side to side? Hi Aimee- Roll them lengthwise and then cut in half! Enjoy! Always looking for a good appetizer. Excited to try these. Can you use any type of white bread? Thanks. I have the best results with Pepperidge Farm white bread or English muffin bread. Enjoy! Not a stupid question at all!! When you wrap the bacon around the bread it will stick when it bakes. No need to use a toothpick. Good luck! Can these be made, refrigerated, and cooked the following evening? Hi Mary, I haven’t tried doing it the day before so I can’t speak to that. I have made them the morning of and then covered them tightly and baked at night. That works great! Let me know if you prep them the night before with success! Good Luck! Question: have you ever made them and frozen them for use later and if so did you freeze after baking or before. This was a huge hit at our monthly get together tonight!!!!! I will save this recipe for future use and recommend it for anyone that loves bacon, (and who doesn’t?) But allow more prep time or you will be in trouble. Hi Norma, I usually stack the bread and cut the crust off, it goes much faster! I haven’t tried freezing then. Let me know if you do and have success! Does the bacon come out crispy or chewy? And is it cooked all the way around or would I need to precook the bacon a little before wrapping? The bacon comes out crispy! No need to precook the bacon. Enjoy! Are you using plain cream cheese or some flavor? Hi Ashley, I use the whipped plain cream cheese and then sprinkle the chives on top. Hope that helps. Enjoy! Just to be sure, looks like you use 6 slices of bread. They are then cut in half when prepared and ready to bake. Is this correct?? Hi Janice, I use the whole loaf (or as many as I can with the bacon I have) and cut in half before I bake. Enjoy! Those are one of our favorites! These are great. For a little twist add a piece of steamed asparagus on the cream cheese before you roll it up. You won’t be disappointed. We use the jar pineapple cheese cream cheese spread. This sounds yummy too! Do you roll them up like a jelly roll — pinwheels? Yes, roll them up like a jelly roll and the wrap the bacon around the bread and cut in half! Hope e that helps. Enjoy! Has Anyone tried a gluten free bread for these? I can’t see that it would make much of a difference. Hi Wayne, I haven’t tried gluten free bread when making these. Please let us know if you do, we would love to hear your results! Do you place rolls on a rack so grease will drain or do you just place on cookie sheet so the bacon grease is absorbed into the rolls. You can do it either way. I usually just line the pan with foil and bake them directly on that. Do you have to flatten the bread or just use it as is? You can roll as is once the crust is cut off or flatten a little bit for easier rolling! Good luck! Lisa, is the Pepperidge Farm white bread denser than regular white bread, say Wonder or Bunny Bread? Is that why it works out so much better? Hi Judith, I have never made it with the Wonder or BUnny bread., but let me know how it turns out if you try it. I like the Pepperidge Farm original because it is dense and can hold up to the bacon. However you make them, they are delicious! This is the first I’ve seen of something close that grandma used to make and now I make.Instead of chives, use crushed pineapple, mix with cream cheese and spread on bread and wrap in bacon. It is absolutely amazing!! I have made a big batch weeks ahead, baked them until the bacon shrinksj but isn’t entirely crisp, cool, frozen them on a cookie sheet then put them in a Ziploc. Great to have on hand for company (or movie night) don’t thaw, just pop in the oven until crisp. Hope that helps the make ahead/ freeze questions. Bacon, cream cheese, and English muffin bread! Three of my favorite things in one great sounding appetizer/snack. Can’t wait to try these! I made mine with onion chive cream cheese and pineaple in the center.. Changed my life! My mom taught us to make these when we were kds in the 70’s. We used “wonder bread” type white bread & smashed the slices flat with a filling pin. Then did the rest similarly, tho we broiled them rather than baked them. I still make these for parties. They can also be frozen raw if you want to make them WAY in advance. Rolling pin not filling pin. Thanks autocorrect. Oh my gosh I keep forgetting about these. I used to prepare these for my mom back 35-40 years ago when I was young and she was having guests but we used white bread with the crusts cut off. I made them for a party about ten years ago and they were the first thing gone. Thanks for the recipe and the reminder! Aren’t they such a fabulous appetizer? Glad you found them again! Made these today. Wow! Thanks! I tried these two ways. Your way, and then I also rolled them in a combination of Chipoltle chili pepper, chili powder and brown sugar before baking. It gave them a sweet and spicy kick! This is a keeper! My husband preferred the sweet, spicy version, but they were both good. I also added grated Parmesan cheese to cream cheese by mistake ( apparently I saw it in another recipe beforehand) Delicious! Love these additions, they sound delicious!